In November, I was invited to the re-opening of the Wolfers Frères Jewellery Shop in Brussels. As of 29 November 2017 the interior of the exclusive jewellery business of the Wolfers family, completely designed by Victor Horta, would be revealed once again. This collaboration between Victor Horta and Philippe Wolfers promised to be a spectacular one, and the exhibition would knock my socks off… but did it?!? Exactly 105 years after the official inauguration of the Wolfers Frères Jewellery Shop on the 4th of November 1912, visitors can once again admire the shop in its original setting. To make this happen, the Royal Museum of Art and History (location Cinquantenaire Museum) has cleared a room of approximately the same size and shape as originally foreseen by Victor Horta in the building at rue d’Arenberg in Brussels. But somehow, something was missing. Or were my expectations too high? I have visited so many Art Nouveau museums already… And I had not realised that Victor Horta, by 1912, was already ‘over’ his curly phase. I think I expected the furniture to be more like below picture frame that was designed by Philippe Wolfers. Instead the furniture was beautiful, but sober; tasteful, but restrained. Very restrained. Also, they had taken great measure to discover the colour scheme of the original interior, and yet we can clearly see the walls of the original interior were decorated with wallpaper as opposed to the bare exhibition walls. Furthermore there were rugs and seats and tables to fill the original interior while the exhibition space felt the opposite: empty. So, don’t go there expecting to enter the original Wolfers Jewellery Shop. The displayed collection of Art Nouveau artifacts by Philippe Wolfers and his contemporaries was spectacular though! Personally, I don’t understand why the whole exhibition could not be displayed at the Fin-de-Siècle museum (which would have made much more sense to me), but that isn’t relevant now… it was spectacular! And it turned out there was more in the depot. Much more. In 1889, as the first institution in Europe, the museum was commissioned by Royal decree to actively develop a collection of modern decorative arts. From 1893 onwards the collection began to develop. 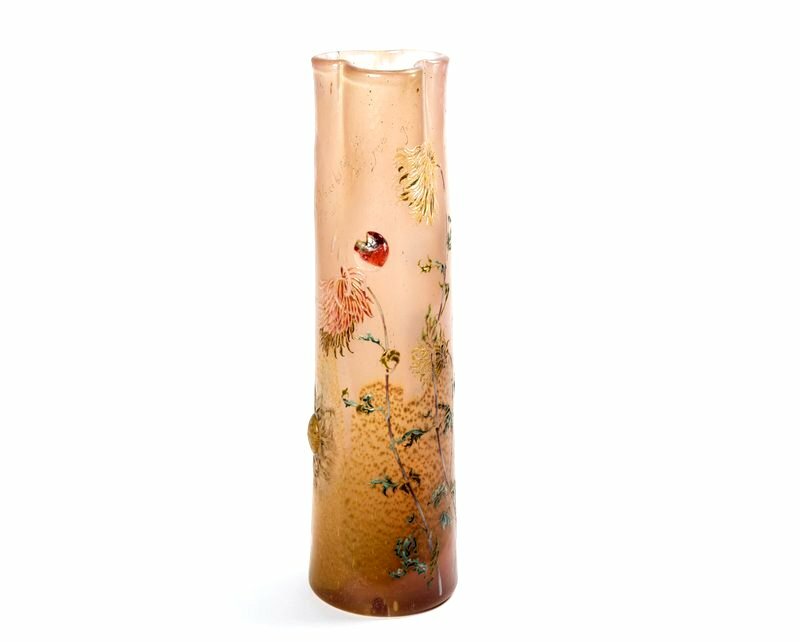 A vase by Emile Gallé was the very first purchase. She cost 350 francs, the annual wage of a cleaning lady. After that, many more exceptional objects were acquired. Some at the legendary salons of La Libre Esthétique, while the universal exhibitions also offered the museum exceptional opportunities to acquire creations of the highest level. The Cinquantenaire museum thus became the first owner of a majority of the objects. Ninety percent of those acquired objects though, never left storage! On top of that, the King Baudouin Foundation recently acquired an exceptional collection of masterpieces by Philippe Wolfers (1858-1929); a selection of the best pieces Wolfers cherished his entire life. Crucial for this acquisition was the good relationship the Royal Museum of Art and History established over the years with the Wolfers family. After the death of granddaughter Claire-Nelly Wolfers, the museum was given the freedom to choose the most special items from the collection of the Wolfers family (The Wolfers & Petrucci Collection). For this the museum could count on an important facilitating role of the King Baudouin Foundation, whose mission it is to preserve and safeguard important heritage for future generations. In addition, the Wolfers family donated a considerable part of the family archives, which is an important source for the study of Philippe Wolfers’ oeuvre. The archive includes the famous ‘Catalog des Exemplaires Uniques’ by Philippe Wolfers, drawings, a large batch of correspondence and a photo collection with ca. 1400 original photographs by the famous photographer Alexandre who photographed the work of Philippe Wolfers. On the opening day, curator Werner Adriaenssens rightfully added how remarkable it is that the exhibition actually includes – in many cases – both the drawing ánd the object. Or in the case of the Swan and Snakes pendant which Philippe Wolfers created for his own wife, both the pendant and a painting of his wife wearing it! So, considering most of the displayed objects have been hidden in the museum’s depot for the past 125 years, or remained the exclusive heirloom of the Wolfers family, I took as many pictures as I could. As a result, the number of pictures and the beauty of the objects may be a bit overwhelming. That is why I organised them in sections: vases, glass and jewellery. Of course there was more, but it is impossible to show you everything. Which gives you another reason to visit Brussels, and spend a few hours at the museum. I’m sure you will enjoy it! I discovered below video about the opening of the exhibition; it offers you a nice chance to ‘have a look around’ yourself, so to speak. And if by then, you still haven’t had enough, you can always order the comprehensive book that was published about The Wolfers Dynasty. It weighs almost 3 kilo’s and counts 500 pages! By looking at the pictures I can very much understand your disappointment with the recreated interior. Apart from wallpaper and rugs missing, I noticed that the original boasted very opulent (albeit not too curly:) lighting which I guess was essential for a jewellery store whereas the replica shows a very different and more modern approach to lighting (probably more appropriate to a museum). Do you have any idea of whether they will keep this exposition permanent or are they really going to dismantle it after 30-12-2018 as their web site seems to suggest? Never apologize about the amount of pictures you share as it’s truly a pleasure to be able to “see” it all through your camera lens and words. Thank you for sharing your passion so well. Hi Ingrid, thank you for your kind words! And you are right, pictures are the only way one can see an exhibition, if one cannot visit the exhibit personally. That is why I always try to take as many pictures as possible… It’s just that the post becomes só long… and sometimes even chaotic. A solution would be a slide show, but I am always afraid that people won’t have the patience to wait until the end of the slideshow … hence the sections. Hope to see you here again!!! Of course, I am so happy to have found your blog. I use slideshows in my blogs: if people don’t gave the patience to look at the pictures, they probably don’t read or scroll till the end anyway. It’s really their loss when the subject is so interesting. I take zillions of pictures as well, a real passion! So glad to have found you. And now the collection is also extended! What happens after the exhibition. Do they keep it in the same place? How nice, thank you! I also still have a Jugendstil agenda for you. I have to go back to work tomorrow. Shall we meet in the evening? Thank you for posting those! In the New Year lull, I am catching up with posts which I saved until I had time to properly enjoy them! And only yesterday, I had a message from Eurostar, offering special rates to Brussels- perhaps I should take advantage of the offer! Are you of an age to remember the magnificent Art Nouveau exhibition put on by the Victoria and Albert Museum in London in 2000? I still have the catalogue from that, it was a marvellous exhibition.